The "Ultimate Market Timing Model" is a long-term market timing model based on research outlined in our post Building the ultimate market timing model. The Trend Model is an asset allocation model which applies trend following principles based on the inputs of global stock and commodity price. In essence, it seeks to answer the question, "Is the trend in the global economy expansion (bullish) or contraction (bearish)?" My inner trader uses the trading model component of the Trend Model seeks to answer the question, "Is the trend getting better (bullish) or worse (bearish)?" 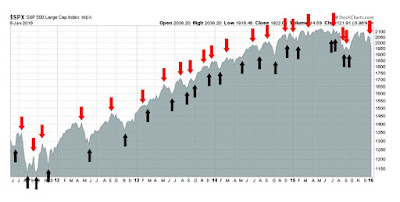 The history of actual out-of-sample (not backtested) signals of the trading model are shown by the arrows in the chart below. Update schedule: I generally update model readings on my blog on weekends and tweet any changes during the week at @humblestudent. Whew! Q4 GDP came in at 0.7%, which was below expectations of 0.8%, but growth was still positive and well above some of the Apocalyptic calls for a negative print. This week, we saw further confirmation that macro tail-risk is limited. The US economy is not headed for a recession and the downside risk from China has also been contained. The full post is at our new site here. Subscribe for notification of free posts, which are open and available to the public two weeks after publication. In the past several weeks, I have been seeing rising levels of angst in social media as the stock market tanked. While anxiety is certainly appropriate for traders, this kind of volatility shouldn't be a concern for investors as long as they have a plan. Here is what I mean by having a plan. I've been giving much thought about the investment philosophy behind the post over at Philosophical Economics about the GTT market timing model. To understand what`s behind his investment philosophy, let`s start back with first principles of equity investing. The equity claim represent the "stub" claim behind debt, or bond financing in a company and therefore represent greater investment risk. Financial theory holds that higher risk should be rewarded with higher expected (average) return. While equities earn more than bonds, on average, they will be subject to higher levels of risk. The Philosophical Economics GTT model is a way of mitigating some of the risks of equity investing. When it spots an unfriendly market environment for stocks, it imposes a greater degree of risk control with the use of moving average based trend following models. That way, the investor can avoid the worst of downside risk while capturing upside return. An overly aggressive central bank tightening monetary policy. If we ignore the risk of war and rebellion for the moment, the Jesse Livermore GTT model only addresses a recession risk forecast, but ignores the risks posed by excessively tight monetary policy. His GTT model would have stayed long equities during the Crash of 1987, when the Fed raised rates twice in September to defend the dollar. A proper asset allocation model also needs to consider the effects of central bank policy. Here is where I think I can add value to that modeling framework. Saudi Arabia outlined ambitious plans on Monday to move into industries ranging from information technology to health care and tourism, as it sought to convince international investors it can cope with an era of cheap oil. A meeting and presentation at a luxury Riyadh hotel was held against a backdrop of low oil prices pressuring the kingdom's currency and saddling it with an annual state budget deficit of almost $100 billion - the biggest economic challenge for Riyadh in well over a decade. Top Saudi officials said they would reduce the kingdom's dependence on oil and public sector employment. Growth and job creation would shift to the private sector, with state spending helping to jump-start industries in the initial stage. "It's going to switch from simple quantitative growth based on commodity exports to qualitative growth that is evenly distributed" across the economy, said Khalid al-Falih, chairman of national oil giant Saudi Aramco. What KSA faces is a classic problem in development economics. How do you create new industries and employment in an economically depressed region? Bullish or bearish? What's your time horizon? Update schedule: I generally update Trend Model readings on my blog on weekends and tweet any changes during the week at @humblestudent. As the market has been experiencing a high degree of volatility, this week's post will be split into two parts, which reflect the divergent views of my inner trader and inner investor. While my inner trader believes that the markets will be volatile and treacherous for bulls and bears alike, my inner investor thinks that concerns are overblown. Investors shouldn't feel paralyzed like mid-Atlantic Americans are by the Jonas blizzard this weekend, as those fears will all melt away by spring, if not before. 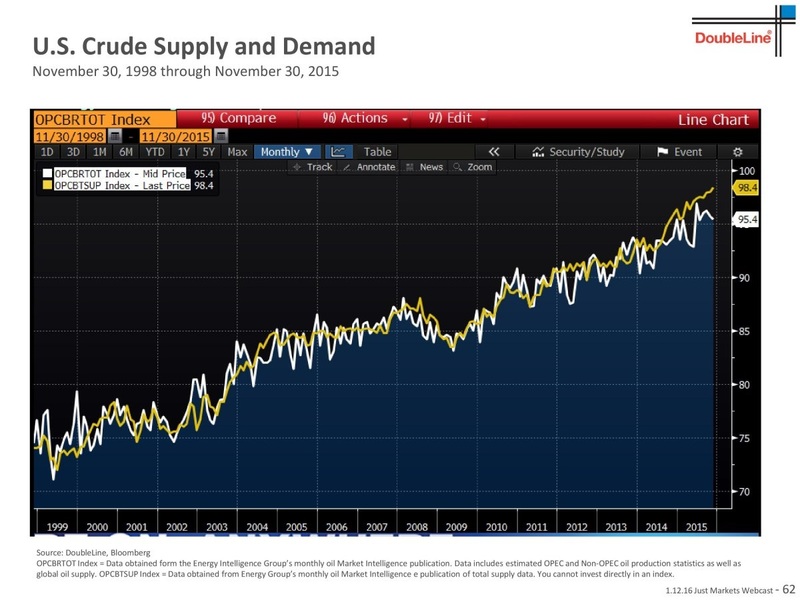 The bad news just doesn't stop coming for oil. It all began when Saudi Arabia had turned on the production spigots to counter growing production from American frackers, and now it has to contend with the geopolitical dimensions of the growing power of Russia and Iran in the Middle East. 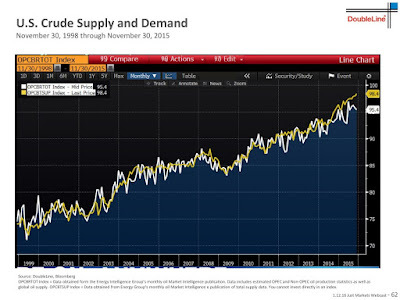 The calls are growing for $20 oil and even $10 oil as there seems to be no prospects of an end to the oversupplied market. We are extending the deadline for taking new subscribers from midnight Friday (Pacific Time) to midnight Friday January 22, 2016 because of the website outages in the last few days. Readers who aren't ready to subscribe can receive notification of free posts, which are open to the public two weeks after publication, by registering here. Buy! Blood is in the streets! How worried should you be? Well, the stock market certain took a fright last week! At this point, we have to ask ourselves the question of how worried should we be about the market outlook. For investors, the answer to that question depends on your time horizon. Do you need the money next month, next quarter or next year? If you need the money in such a short period, then did your asset allocation reflect those circumstances? I would contend that as your anxiety level should be falling as your time horizon lengthens. What is the downside tail-risk for stock prices? What does the near-term risk-reward environment for stock prices? The new site went down on Friday because of a failed software update. As a result, we are extending the deadline for taking new subscribers from midnight Friday (Pacific Time) to midnight Tuesday January 19, 2016. The new site is down because of a failed software update. We will have it up as soon as possible. Please check back at this page for status updates. Site is back up but unstable. If anyone has any problems, please email me at cam at humblestudentofthemarkets dot com. As a result of these difficulties, we are extending the deadline for taking new subscribers from midnight tonight (Pacific Time) to midnight Monday January 18, 2016. 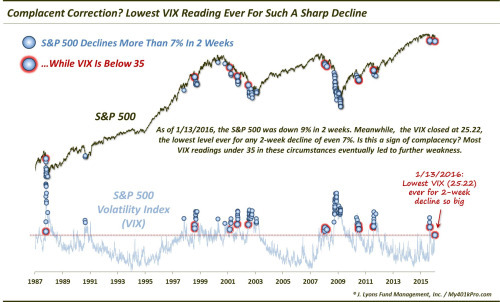 Dana Lyons recently wrote a terrific piece about the level of complacency in the current bout of stock market weakness. The SPX had fallen over 9% in two weeks, but the VIX Index was barely challenging its December highs and it was nowhere near the highs set during the August/September selloff. He found that past instances of where the market fell a lot but the VIX did not respond in a corresponding fashion foreshadowed further stock market weakness. OBOS: This is an intermediate term oversold indicator which indicates an oversold condition when the indicator falls below 0.5. The Trifecta Bottom Model has been uncanny in spotting bottoms in the last three years. The chart below shows the record of this model in the last year, where the blue vertical lines indicate that two of the three components have been triggered (Exacta signal) and the red line indicates that all three were triggered. All marked short-term bottoms. The latest bout of stock market weakness saw TRIN hit a high of 1.97 (not quite 2.0) and the OBOS reach a low of 0.52 (not quite 0.5). Are these readings close enough to trigger a buy signal? Please be reminded that the new site is closing to new subscribers as of midnight (Pacific Time) this Friday, January 15, 2016. This is because I would like to better control the rapid growth of our community. I know that many readers have been following me for a long time. I would like to give them the opportunity to get the best start on 2016. Come over to the new site and take a look. The subscription page is here (US$199.99 for one year, US$19.99 for one month, US$4.99 for a 24-hour day pass). Even if you are not ready to subscribe, you can always sign up for email notification of free posts as they are free and available to the public two weeks after publication. We would love to have you join our community. I thought that, as a change of pace, I would write about where my inner investor is finding opportunities, instead of focusing on the daily gyrations of the stock market and whether it has found a short-term bottom, which is a topic I will cover in a post this weekend. The art of bottom fishing requires a strong constitution, which is suitable for people like my inner investor who has a longer time horizon. You have to go into the exercise thinking that you don't care that you catch the exact bottom, but with a mindset that Mr. Market has put a sale price on an investment. You may buy X at $10, see it fall to $7, but be ultimately rewarded in several years when it rises to $20, $30 or $40 (note that these are just examples and not return forecasts). With that framework in mind, here are a couple of opportunities identified by my inner investor. I was brought up to be modest and I am not prone to taking victory laps, but I was reminded of my post from two weeks ago, The reason why the bulls should be cautious about a January hangover. To be sure, I never expected the kind of downdraft that the market is experiencing, but I was directionally correct. That brings up the point that the new site is closing to new subscribers except for 24-hour day passes as of midnight (Pacific Time) this Friday, January 15, 2016 because I would like to better control the rapid growth of our community. I know that many readers have been following me for a long time. I would like to give them the opportunity to get the best start on 2016. Come over and take a look. The subscription page is here (US$199.99 for one year, US$19.99 for one month, US$4.99 for a 24-hour day pass). Even if you are not ready to subscribe, you can always sign up for email notification of free posts as they are available two weeks after publication. The specter of currency wars and competitive devaluation is in the air. Evan Soltas recently penned a post at FT Alphaville addressing the issue of how petrostates can solve their fiscal woes. The answer was either fiscal austerity or devaluation. The Telegraph reported that the World Bank was urging Saudi Arabia to use its currency reserves to defend the USD-riyal peg and resist the siren song of devaluation. The elephant in the room of competitive devaluation is China. With the latest release of China PMI is looking a bit on the weak side, another round of stimulus would not be surprising at all. If the Chinese central bank were to undertake any steps to stimulate the economy, however, it would have the effect of putting downward pressure on its currency, which could stoke fears of a currency war. Business Insider﻿ reports that Charlene Chu of Autonomous Research has suggested that China needs as much as USD 5 trillion in credit injections in order to have a similar effect as the shock-and-awe campaign of 2009. If Beijing were pursue that course of action, I have a modest proposal for the PBoC. If you signed up for the notification of our Early Bird Special Offer but did not receive it, I have had some reports that they got classified as spam so please check your spam folder. Otherwise you can email me at cam at humblestudentofthemarkets dot com and I will send you the link. As well, I would like to remind readers that we will cease to accept new subscribers as of January 15, 2016 as a way to better control the growth of our new community. Hurry, the deadline is coming up faster than you think. A glass half-full, or half-empty? I have three pieces of advice of my own to all the nervous nellies out there, not to mention the nattering nabobs of negativity, turn off the television, focus on the big picture, and review your asset mix. Are we facing a war or revolution that will cause the permanent impairment of capital (e.g. Russian revolution, World War II, US Civil War, etc.)? Is a recession on the horizon? Is the Fed being overly aggressive and tightening the US economy into a recession? The answer to the first question is obviously no. I also see minimal risk of a US recession (see my Recession Watch page). Using the framework used by New Deal democrat's approach of adopting the Geoffrey Moore long leading indicators, recession risk is low. As well, Georg Vrba`s work also comes to a similar conclusion. As for the third question, the Fed is just starting a tightening cycle and they have made it clear that they plan on being slow and gradual. Moreover, various Federal Reserve officials have indicated that they are tolerant of inflation being slightly over target in order to bring the economy back to full employment. So the Fed can hardly be characterized as being aggressive. I will address each of these issues one at a time, based on a bull vs. bear, or glass half-full or half-empty framework. Finally, I will touch on the market outlook in a more tactical fashion, based on the readings from sentiment models and technical analysis. The full post is at the new site here. 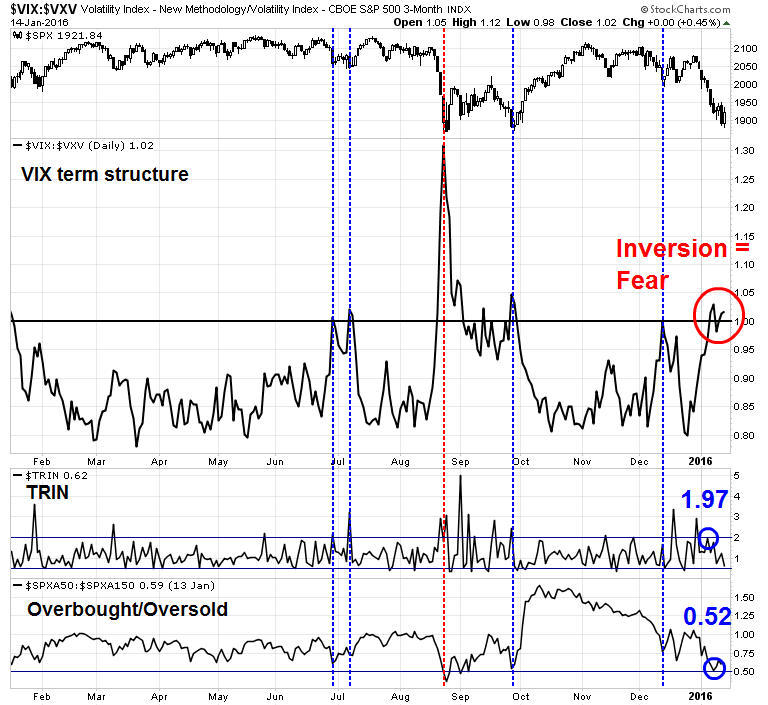 My Trifecta Bottom Model was nowhere close to a buy signal (described here), which was another sign of complacency. I had concluded that a bottom was near, but we may need a further wash-out before a tradeable bottom could be seen. The stock market weakened further on Thursday and a number of fear metrics spiked. Is the market near a durable bottom? The blogger Jesse Livermore at Philosophical Economics recently wrote another brilliant post about the use of trend following models and market timing. He found that trend following models work very well on diversified stock indices, but didn't really understand the mechanism of how they worked. As I pride myself on being a left and right brained quant, I am going to try and explain why these classes of models work and why they perform poorly on individual securities. I would like to think that my last post, The road to a 2016 market top, panicked the market into a vicious sell-off on the first trading day of the year, but I can't think of many people with have the hubris to make that kind of suggestion. As the market closed, the SPX was down 1.5% and it was off over 2% at the worse point of the day. What`s next? At the close, the SPX managed to stay at a key support zone, with RSI 5 at an oversold reading on roughly average trading volume. These readings appear to be constructive and suggest that downside is limited from these levels. 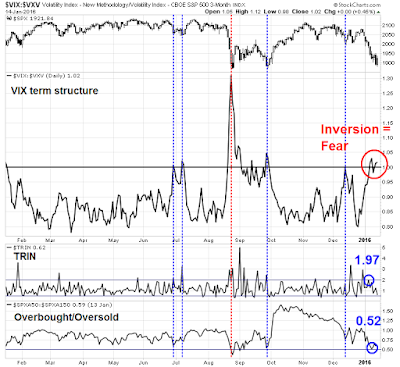 Other key metrics are also flashing oversold readings, but I would warn that oversold markets can get more oversold and my initial take is that there may be some further minor downside risk from these levels. First of all, I want to set the record straight. Despite the headline about a possible US stock market top in 2016, I am not intermediate term bearish on stocks right now. 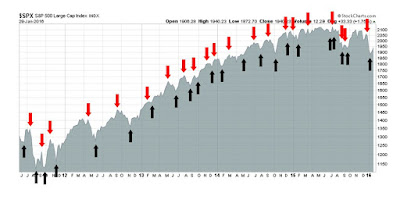 There is an adage amongst technical analysts that while bottoms are events, tops are processes. The purpose of this post to outline the process of how the US equity market is likely to top out in 2016. I don't mean to convey the impression that I believe that equities go down right away. 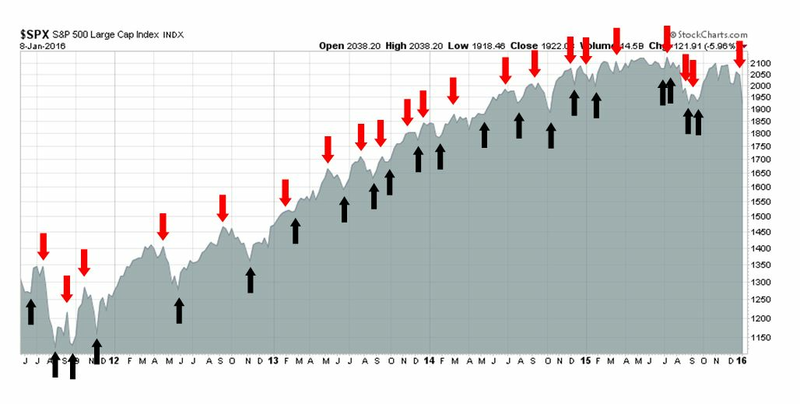 In fact, there is likely some upside left before the market makes its ultimate top before turning down. Let me explain.